The Bulletproof brand was founded by Dave Asprey. His concept being to upgrade yourself and become “bulletproof” through health hacking techniques and pushing the latest science or innovation in health based products. Of course that means they needed to release a glutathione product. 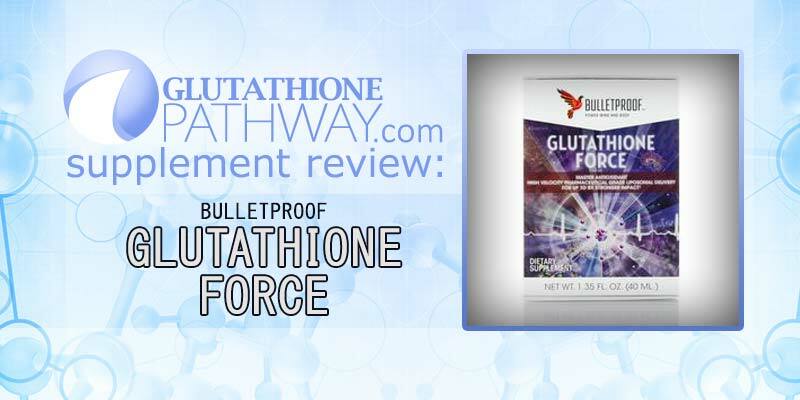 Does Bulletproof Glutathione Force Meet The Hype? This is the only glutathione supplement in the “Bulletproof” body of products. They claim Glutathione Force as the single most powerful supplement to increase your performance, fight aging, and improve brain function. As such they provide an absolutely no nonsense product. Their ingredient list for Glutathione Force is refreshingly quick and easy to find… it is equally spartan. You get 40 ML of reduced glutathione, for $59 USD. 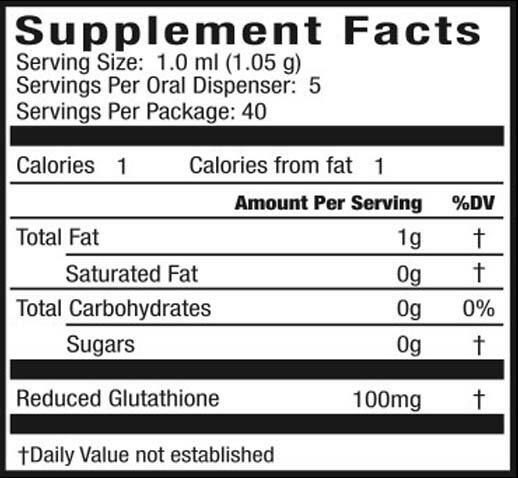 Reduced Glutathione – 100 mg – This is the equivalent of listing L-Glutathione. We believe L-Glutathione to be an effective direct source of GSH despite some claims of it degrading in the stomach, given the right support mechanisms, and based on the latest research there’s evidence to suggest L-Glutathione will transport the gut and help balance your GSH to GSSG ratio. Other ingredients: Water, Lactoferrin, Oleic Acid (from Olive Oil), Phosphatidylcholine, Polysorbate 80 (emulsifier from sugar alcohol and vegetable oil), Glycerin (Vegetable based, US sourced), Medium Chain Triglycerides (MCT Oil), Stevia (Rebaudioside-A) and Natural Flavor (Cinnamon Oil). This product comes with an oral dispenser (syringe) with markings allowing you to push out 1 ml portions, we find this less convenient than a capsule form. The list of “other ingredients” has less prominence and doesn’t include anything that would cause us too much distress, though it’s surprising they don’t highlight Phosphatidylcholine. Confusion Factor: They tout using Liposomal Glutathione and how it’s a unique delivery system up to 8x more effective while the supplemental facts only say Reduced Glutathione. The addition of Phosphatidylcholine in the other ingredients is what makes it “liposomal” by wrapping the sensitive GSH molecule in a fat cell. Dave Asprey and his upgradedself.com staff have definitely put out some interesting products, and we commend them on pushing boundaries. Unfortunately we think they could do better here. The ‘formula’ is limited to reduced or liposomal glutathione, and some flavor enhancers. They do not discuss what type of, or how much Lactoferrin is present. Beyond that there are no real supporting ingredients to speak of to really optimize and help ensure effective glutathione delivery (Beyond of course the obvious Phosphatidylcholine to create Liposomal Glutathione). A syringe or plunger based portion system is uncomfortable and less convenient than a capsule. For $59 USD… we’d like to see more bang for our buck when we buy a glutathione supplement. Leave a comment and tell us what you think of Glutathione Force. This spartan formula from upgradedself.com or Bulletproof Glutathione Force is comprised of... liposomal glutathione. There's not much too it, and we find the syringe dispenser system awkward. For what you pay, you really aught to get more from it. If you are referring to Bulletproof you should abide by their guidelines or consult your healthcare practitioner on safe and effective dosage.